Hello friends! 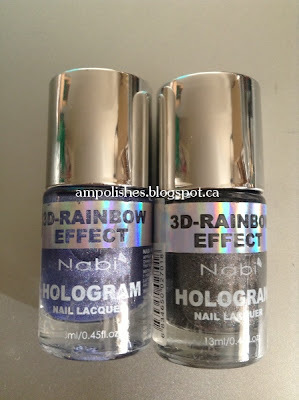 A couple months ago I heard that Nabi was releasing a bunch of holographic nail polishes. I managed to pick up 2 recently and thought I'd share some swatches and thoughts about this collection. This holographic collection consists of 24 different shades, the 2 I'm sharing today are Black and Blue Sky. 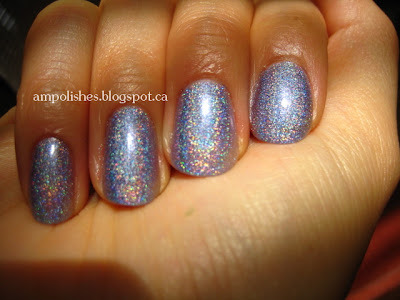 When I first saw these polishes in store I was not at all impressed, there was no holo effect at all. In fact I thought they were all duds because they looked metallic to me. I bought 2 just to try and boy am I glad. On the nail they look completely different. The holo effect isn't strong but it's definitely present. I thought the colours were a little washed out. I wished the colour could've been brighter. 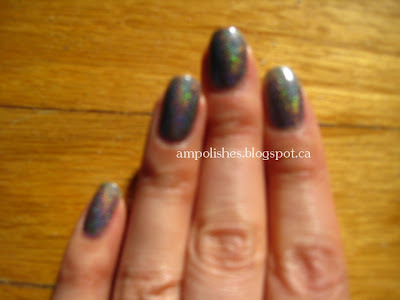 My camera did a terrible job of really capturing the holo flame and in person they're stronger than in my pictures. 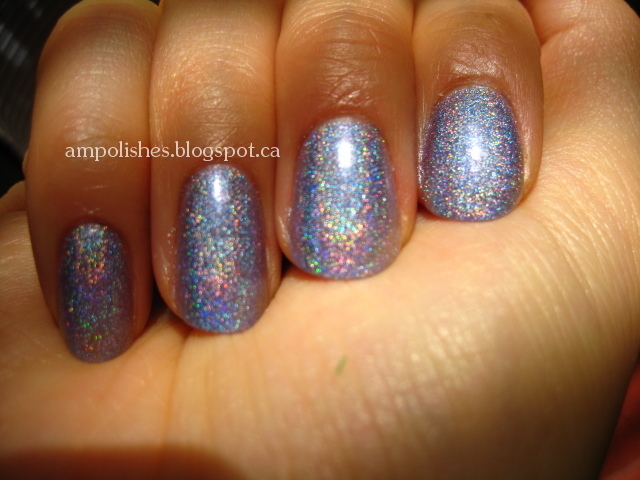 I also thought the bottles looked like a total rip off of the Layla holos. Same shape, silver cap, same label design. I don't own any Layla polishes so I'm not able to do a side by side comparison. 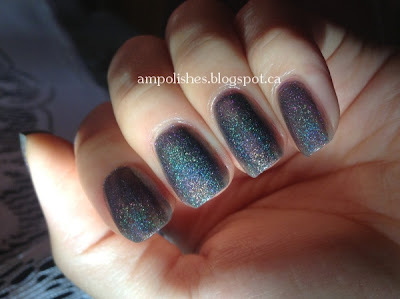 Click more to see swatches!! Not sure why this one is called blue sky, the polish looks purple in the bottle and purple on the nail! 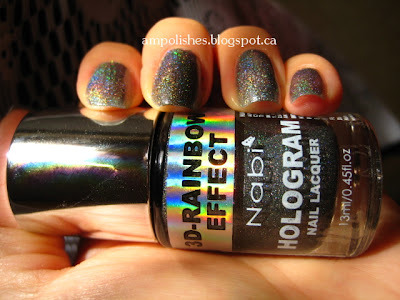 As you can see the linear holographic effect is present but it is not as strong as other holo polishes like the color club halo hues collection. These pictures were taken in direct sunlight. I didn't take any pictures with indoor lighting because the holographic effect was non-existent. Sorry for the blur, wanted to show the holo flame! This colour looked more like dark grey in the bottle but ended up being a lot darker on the nail. 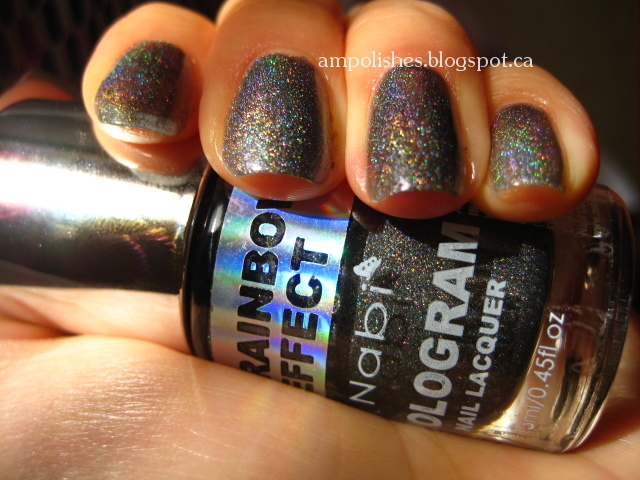 I would say the holo effect is the same as Blue Sky. Not super strong but definitely linear. Much like Blue Sky, the holo flame could not be seen indoors so I did not bother to take any pictures of it indoors. Both polishes were on the sheer side and I had to use 2 thick coats and 1 more thin coat to cover up bald patches to achieve opacity. The polish smelled pretty strong as well, so be sure to apply it in a well ventilated room. One more down side, open the bottle and check the brush before paying! The brush in my bottle of Nabi Black was complete slanted. The brush itself was fine but it made application a bit difficult. These polishes are 13ml in size and were only 2/$5! 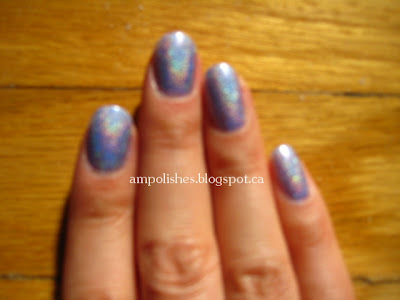 You really can't beat a price of $2.50 for a bottle of holographic polish! 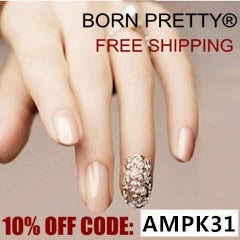 I purchased my polishes at Urban Plant (a Canadian clothing store). They are also available on eBay. What do you think of these Nabi holographic polishes, will you purchase some? Which colours interest you? Let me know! No problem Steph! I love sharing deals with fellow polish lovers. These are the only Nabi polishes I own so I don't know the full scale stank with the other collections lol. But I thought they didn't smell as bad as Klean Colors. I have a few Nabi glitters and they smell horrendous too. 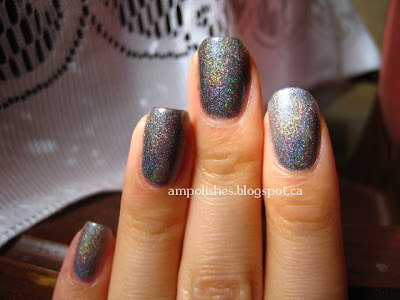 I'm going to pick up some of these holos soon, because I'm a sucker for holo anything. They also seem to have a beautiful dark brown that looks pretty unique as well as a few other shades that look promising. The blue you have is quite pretty - almost periwinkle. 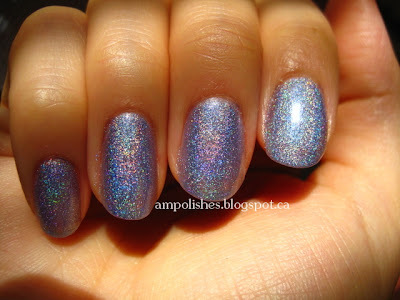 I'm a huge sucker for anything holo too so if these were as holo as Laylas I think I would've cleared out the store (especially at that price). I thought the two I picked up were not as pigmented as the other colours they offer.